Chairman Eason then invited public attendees with opening comments to speak. Larry Hanson, the City Manager for the City of Valdosta addressed Council regarding recent flooding problems in the City. 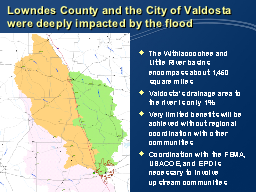 The City of Valdosta is at the downstream end of a large drainage basin, and the City comprises only 1% of the basin but receives runoff flows from all the upstream areas. Some communities in the basin upstream of Valdosta lack regulations and coordinated runoff control measures. The City would like to see a regional reservoir to serve as flood control and water supply as a potential project. • Form a subcommittee or task force to continue the Council's work after this first round of planning. • Develop educational materials and encourage municipalities to adopt stormwater management ordinances. • Recommend prioritized funding for a potential regional water supply and flood control project. • Apply for Georgia Environmental Finance Authority (GEFA) funding for such a project. CM: The forecasted population of Valdosta will double over the next 40 years. I agree we need a task force to look at storage and supply projects. LH: We developed a stormwater utility and master plan to control local runoff but we can't manage the 15,000 square miles of upstream runoff. CM: What would you say is your biggest problem faced? LH: Upstream development contributing to flooding, erosion, and debris in Valdosta. CM: Are you suggesting other municipalities need to implement new subdivision regulations? LH: Not just new subdivisions but all development, such that post-development runoff does not exceed pre-development runoff. Creative solutions are possible. CM: Would this best fit under Erosion and Sedimentation Control regulations? EPD: No, Erosion and Sedimentation Control regulations just control a symptom of the overall problem. I will take the State's role in promoting a task force. CM: This was done in north Georgia in the 1960's. EPD: Yes, it's a proven strategy. CM: Federal and State governments have a bad habit of setting mandates and then not funding them. That's a bad idea. LH: Is future funding available? EPD: Potential funding is available, and projects recommended in the Plan will get funding priority. CM: The Wastewater Treatment Plant (WWTP) relied on inaccurate FEMA maps. Development in the floodplain has a big impact on future flooding. We need to enforce no development in the floodplain. CM: I'll be Chairman of the GEFA Board next year and I can tell you most of GEFA's money goes to Atlanta and the metro area. Not much of it makes its way south. CM: High and low flow issues in our region are linked. We don't want to point fingers but I have seen changes in Runoff coefficients in urban, suburban, and rural areas. I support forming a regional group to study this impact.